100VDC series product is a linear mode single-channel output high-precision programmable DC power supply. It can meet various demands for the application of simple DC power supply with stable DC output and built-in voltage & current measurement capability. ● Lower ripple and noise . ● High resolution and accuracy ( 0.1mV, 0.01mA). 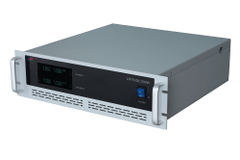 ● Single-channel 100 VDC 1. 5 A output independently. ● High brightness vacuum fluorescent display (VFD). ● Temperature for work condition is up to 50℃. ● Use SCPI standard communication protocol. ● Built-in RS232 communication interface/port. ● Support externally triggered input and output (optional). 100VDC series programmable DC power supply is designed with standard size (19 inch & height of 3U). This feature makes it be easily integrated in testing system and achieves the testing under various situations. High resolution and accuracy ( 0.1mV, 0.01mA). Dual-channel 100 VDC 1.5A output independently. Temperature for work condition is up to 50℃.